Wheels are everywhere in our world today—in very obvious places (on cars, trucks, and airplanes), but also hidden inside everything from computer hard-drives and clothes washers to electric toothbrushes and dishwashers. Six thousand years ago, there weren't any wheels at all. The rise of the wheel, from a basic turntable that helped people mold clay pots to a key component in hundreds of important inventions, owes everything to the simple and effective way it helps us capture and harness energy and transform forces. Let's take a closer look! Photo: Friction isn't a problem when you're traveling on ice, like the occupant of this dogsled. But sledges don't move nearly so well on normal terrain: that's why wheels were invented. Photo by Jo Goldmann, courtesy of US Fish & Wildlife Service. In modern times, we assume there have to be roads for wheels to travel on. 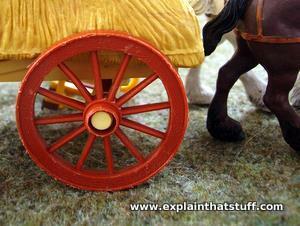 But wheels were first used on carts precisely because there were no smooth tracks to use for reliable transportation. Before carts were invented, people dragged loads on sledges and frames hauled behind animals such as horses and dogs. Sledges were an effective way to move heavy loads before wheels were invented, but friction slows them down. Frames, where a load is part dragged and part carried, help to solve this problem. The A-shaped dragging frame, known as a travois, is thought to have been invented thousands of years ago and Native Americans used it up until the 19th century. Even with animal power to help, friction between the rough ground and the frame made the going difficult. Wheels reduce friction. Instead of simply sliding over the ground, the wheels dig in and rotate, turning around sturdy rods called axles. 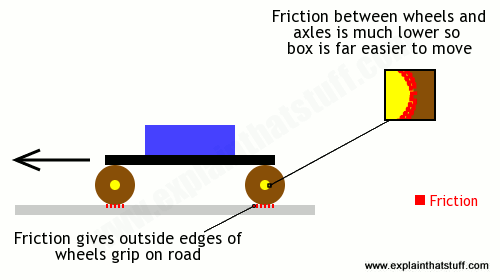 That means the only friction the animals have to overcome is at the point where the wheel and axle meet—between the relatively smooth inner surface of the wheels and the equally smooth outer surface of the axles around which they turn. Wheels provide leverage (in other words, they are examples of force multipliers or simple machines). A cart with bigger wheels is easier to push because its greater-diameter wheels work like bigger levers, multiplying the pulling or pushing force and making it easier to turn the wheels around their axles—in exactly the same way that a long spanner makes it easier to loosen a nut. Let's look at both these things in more detail. When you push the same box loaded onto a cart with four wheels, there's much less resistance. The box no longer has to slide along the ground so that part of the friction disappears. However, wheels don't eliminate friction entirely, as some people think—far from it! There must be friction between the four wheels and the ground or they'd simply slide along (like something being pushed on ice). Friction between each wheel and the ground helps it "dig in" so the wheel can rotate. Wheels on carts help in another important way too: they work like levers. The rim of a wheel turns a greater distance than the axle so, in the case where you're pushing a cart from behind or pulling it from the front, there is more force at the axle than at the rim. That means it really helps if your cart has big wheels because they give you more leverage, magnify your pushing force, and help you overcome the force of friction at the axles. 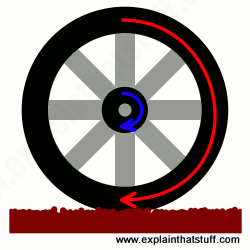 Turn a wheel at the rim and the force you apply (red arrow) is multiplied to give a bigger force at the axle (blue arrow). The bigger the wheel, the greater the effect, because the radius of the wheel works like a lever. The bigger the wheel, the longer the lever, and the more leverage you get. Turn the wheel at the center, instead, and it works the opposite way. Now the rim of the wheel goes further and faster. That's how you can use a bigger wheel to multiply speed. However, if you apply a force at the center of a wheel, the leverage works in reverse and you get less force at the rim, even though you're getting more speed there. Just as with gears, you can't increase both the force and the speed at the same time. If you increase one of them, you must reduce the other, otherwise you'd be using a wheel to make energy out of thin air (which violates a basic law of physics called the conservation of energy). People were using animals for transportation long before the invention of the wheel and even before the development of human settlements and agriculture in the Middle East around 8,000–9,000BCE. Dogs are believed to been tamed and domesticated in China around 13,000BCE; horses were domesticated much more recently around 4500BCE. Animals used for human transportation in this way are called beasts of burden. No-one knows exactly when, where, or how wheels were invented. Potters wheels are believed to have been widely used around 7000 years ago in Mesopotamia (a region of the Middle East now largely occupied by Iraq): it's easy to imagine how a potter might have hit upon the idea after repeatedly rotating a stool to work on a pot from different angles. We don't know when the potter's wheel was invented either, but some historians believe it may date from as far back as 8000BCE. In its early form, it was little more than a turntable or "tournette" mounted on a central support. Perhaps someone eventually turned a potter's wheel through 90 degrees to make a new kind of transportation, or perhaps the wheel was completely reinvented for this new purpose, but another 1000–1500 years elapsed before wheels were first used on carts. Most likely, someone using tree trunks as rollers realized their job would be easier if the logs could somehow be fixed in place underneath the load, sliced up like salami so they would pass more easily over and around obstacles. Such an effective idea was bound to spread widely and the wheel found its way to Europe and Asia during the following millennium. Photo: Early wheels were made from rounded off slices of tree trunks or lumps of stone with holes cut through for an axle. Solid wheels like this evolved into lighter and faster semisolid wheels, with a large solid plank across the middle and a few spokes on the diagonals. Fully spoked wheels, like the model cart wheel shown here, take the idea a step further, doing away with as much heavy mass as possible without sacrificing strength. That made possible the invention of fast chariots, such as those used in Roman times. Wheels work more effectively when they have a smooth road surface to travel on. The Romans pioneered road-building from around 300 BCE onward as a way of linking disparate parts of their empire. Roman roads were built in a similar way to modern ones from layers of different materials, including large boulders to support weight, and smaller stones, sand, and tiles to allow drainage. Often cement and concrete (another important Roman technology) were used to bind loose materials together. On top, there was a hard-wearing surface made of flattened stones cut and pieced together like a jigsaw. Roman roads were famously built in straight lines to minimize traveling time. In terms of their basic science, the wheels that carry our vehicles today are virtually identical to those first used in ancient times: though built with more sophisticated materials, they are still essentially flat discs rotating on solid axles. More interesting is the way wheels have evolved in other ways in a range of increasingly complex machines. 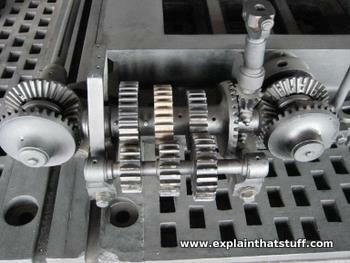 Photo: The gear evolved from the wheel and axle. Put lots of gear wheels together and you can transform force and speed in a machine in all kinds of ways. With the addition of teeth around their rim, wheels become gears, capable of changing the torque (rotational force) of a machine or its speed: gears enable a bicycle to go fast or climb a hill very slowly—with the rider pedaling at exactly the same rate in both cases. 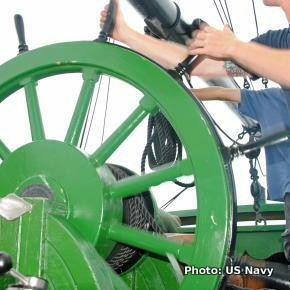 Extended into drums, wheels can be used as winches to raise water from wells, rocks from mines, or anchors into ships: simple machines of this kind are known as capstans and windlasses. Winches that use several wheels, linked by multiple lengths of rope, become pulleys: powerful machines that greatly magnifying pulling forces, allowing a person to lift many times their own weight. 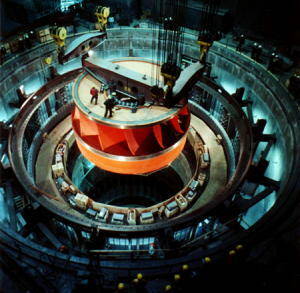 Photo: Water turbines (like this one from the Grand Coulee Dam in Washington State, USA) also evolved from the wheel and axle. Photo by courtesy of US Bureau of Reclamation. Wheels form the heart of turbines (machines that capture energy from a moving liquid or gas): waterwheels and windmills, civilization's most important sources of machine power in the Middle Ages, both evolved from a basic wheel turning around an axle. Engines too rely on wheels to convert fuel into energy and drive a vehicle: in a modern car engine, for example, fuel burning in the cylinders pumps pistons back and forth, turning an off-center axle known as a crankshaft, which then powers the gearbox and the road wheels. In 7000 years, the wheel has gone far beyond its original use as a pottery-making tool. By helping us to move loads, harness energy, and transform forces, this simple but amazingly effective invention literally made it possible for people to conquer the world! Wheels: A Pictorial History by Edwin Tunis. Johns Hopkins University Press, 2002. A modern reissue of a classic 1955 book that charts the history of wheels from ancient times to the 20th century. Making Machines with Wheels and Axles by Chris Oxlade. Raintree, 2015. A very good 32-page, project-led introduction for ages 7–9 that puts wheels in the broader context of simple machines. Invention by Lionel Bender. DK, 2013. A tour of the classic mechanical, electrical, and electronic inventions we tend to take for granted. Rather dated and with very little coverage of modern inventions, but still a reasonable overview of ancient technologies, including various types of wheels. Wheel by David and Patricia Patricia Armentrout. CATS, 2009. A simple (32-page) introduction to wheels and how they work. A Salute to the Wheel by Megan Gambino, The Smithsonian, June 17, 2009. A whistle-stop tour through wheel history. Remaking the Wheel: Evolution of the Chariot by John Noble Wilford, The New York Times, February 22, 1994. A fascinating introduction to the development of spoked wheels and fighting chariots from the NY Times Archive.